If you have twins on the way, shopping for the new arrivals is a little more complicated than simply buying two of everything. 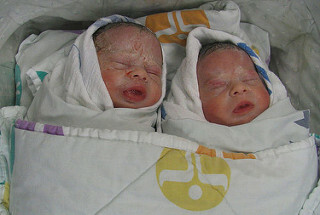 Parenting newborn twins offers a special challenge that can sometimes be made a little easier with preparation. What are the must-have baby items for twins? And what else can you do to prepare for two babies while you are expecting twins? A double stroller, or a triple stroller if you have an older child who will still need a stroller. A single stroller, and a baby carrier. When large strollers are not practical, this is a good way to transport one kid in a stroller and one in a carrier. You may like to get two baby carriers. Some moms wear both twins at the same time, but one parent carrying one baby is great when you are going on family outings. Two baby swings. Or two bouncy seats. Or both. These will come in handy when your twins reach around four months, and perhaps before then too. Nursing pillows like a Boppy if you are planning on breastfeeding. Many twin moms report not liking nursing pillows especially designed for twins. Enough baby clothes for the two of them. Obviously. A washing machine that can carry a large amount of laundry! Stockpiles of frozen food, made during pregnancy. Someone to help you clean your house, especially in the first two weeks after birth, and in the period where the twins learn to walk! A new attitude. With twins, you may have to come to terms with the possibility that you will need outside help. If people offer to help, there is no shame at all in accepting such offers. You can even ask. If your partner can get some time off after your twins are born, that would be a truly great help. By "some time off" we mean weeks, and not days.